Last week after I played Peppermeister Roulette, I was left with a runny nose, a burning sensation in the back of my throat, and a rainbow of pretty peppers. Since these peppers were grown with love and care by the great Peppermeister, I wanted to find just the right recipe to do them justice. I found what I wanted over at Skinny Girls and Mayonnaise in a post called Phoenix from the Flames, a fitting title for Peppermeister’s prized peppers (say that three times fast). Even better, the recipe uses one of my favorite underestimated meats: chicken thighs. I tweaked the recipe slightly, adding more sugar, replacing dry hot red pepper flakes with a fresh Cherry Bomb, omitting the butter, and adjusting the salt and spices a bit. But I give full credit to Sean from Skinny Girls and Mayonnaise. After the brine, the dry rub, and the grilling, these chicken thighs are spicy, smoky, sweet, and pepper-licious. 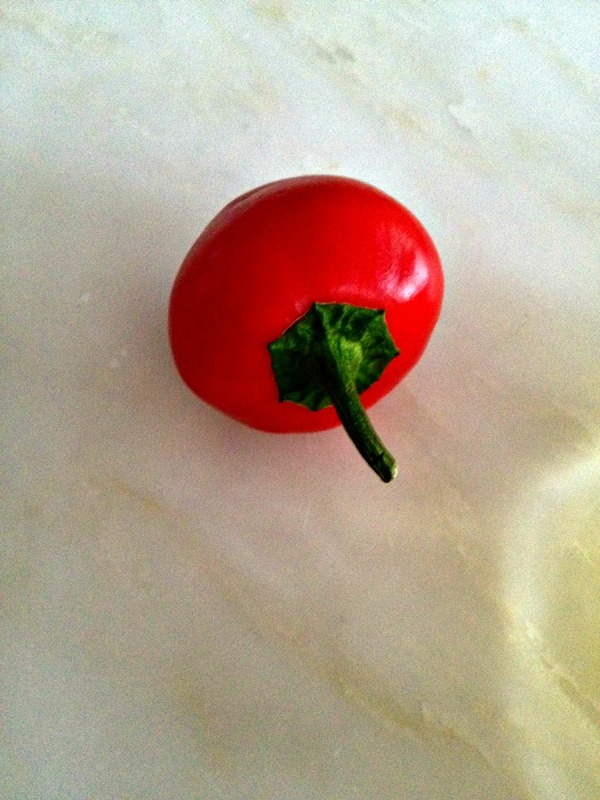 This pepper got me when playing Peppermeister Roulette. That’s why I sliced him and diced him for this recipe. The day before, make the brine. In a large bowl or tupperware container, toss the chicken thighs in the brine, cover and refrigerate. Toss once or twice over the course of the brining. 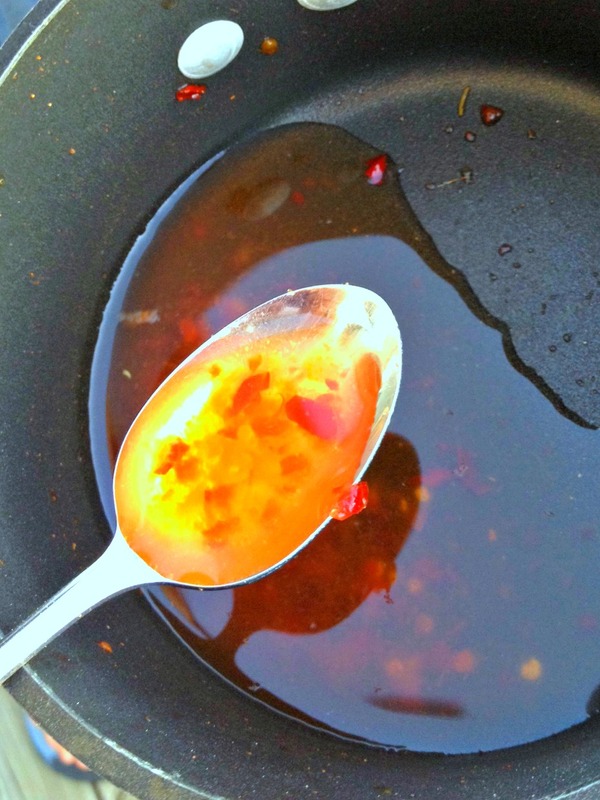 The next day when ready to grill, in a small saucepan, combine the vinegars, sugar, chili garlic sauce and Cherry Bomb pepper. Heat over medium until simmering and remove from heat. Remove thighs from brine. Pat dry with a paper towel. Generously sprinkle chicken with the dry rub. For a side dish, I sprinkled ears of local corn with leftover dry rub and grilled–so good! Who knew celery seed and grilled corn were a perfect combination? Thank you, Peppermeister and Sean, for making this dish one of the best things I grilled all summer. I love spicy chicken recipes. I don’t have any cherry bomb peppers, but the last sauce I made to brush on smoked chicken legs had 7 habaneros in it. This looks great! 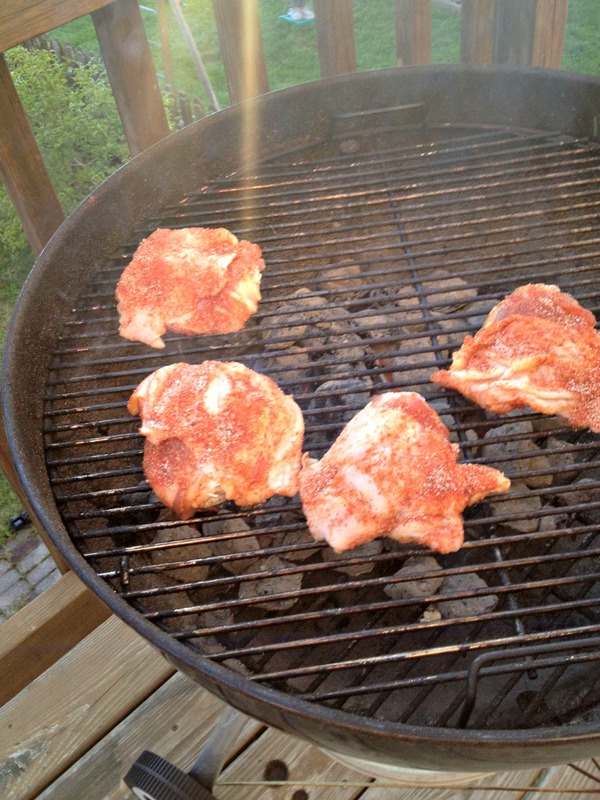 Whoa… those chicken thighs look perfect! Not just because you used an expertly grown pepper. Grilling thighs on a charcoal grill is a fine art. Avoiding charred skin while maintaining crispiness is no easy task. Great use of the cherry bomb, I use fresh peppers in all of my marinades. You know this is the beginning and end of both of our current marriages, right? Those thighs look AMAZING (ahem). 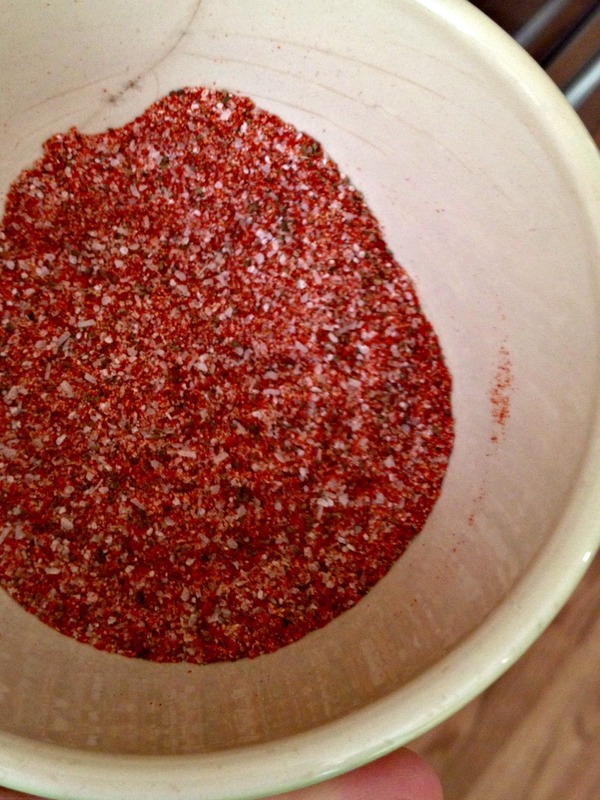 And dry rub/celery seed on corn – we’ll have to try that! Peppermeister’s been putting fresh, fancy cinnamon on ours lately (Accidental Stepmom gave it to us, actually – look at this foodie, bloggy loving going on!). I like how they are only our current marriages. haha. Cinnamon on corn??? Sounds ludacris (yeah I meant to spell it that way)! I shall check out Accidental Stepmom forthwith. When it comes to cinnamon, the fancier the better. It’s called ceylon, a.k.a. “real cinnamon”, a.k.a Mexican cinnamon. I melt equal parts butter and honey (or agave) and mix with some ceylon, and peppermeister powder. Brush on the corn, wrap in foil and grill. It’s pretty incredible. I think I just totally spoiled an upcoming p-meister post…. Thanks for the shout out, Luv. Looks tasty! You folks reading this, PUT THAT BUTTER BACK IN!!! (But make sure it’s, ahem, local butter…) Rach, didn’t you read my “Everything’s Better With Butter” post!?? Taking some butter down to the beach later. I’m gonna baste everything in sight. Ahahaa. Good luck with that! Oh, yum! 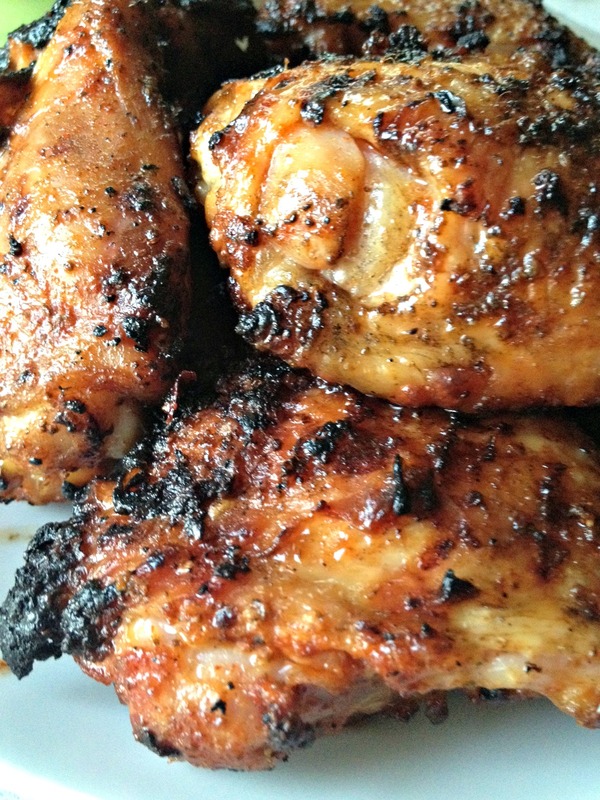 And we agree–we only use chicken thighs–so much more flavor!! Have to try this! It’s seriously good. And easy, especially if you want to use red pepper flakes for the vinegar sauce instead of a Cherry Bomb. Any pepper will do really, depending on your taste. This looks sooooo ridiculously good, Rachel! And I don’t even typically like dark meat. But I think I could eat it with this lusciousness involved. I always brine chicken before I fry it — I make some mean fried chicken — and it makes it so yummy. This recipe will switch you over to the dark side. 🙂 I’ve never perfected fried chicken; maybe I need your recipe. Are you sure you don’t use shake and bake? Remember that? It’s Shake and Bake and I helped. How could I not remember? My recipe is awesome. Brine chicken in a TBSP of salt mixed into buttermilk for about two hours. Then dredge through seasoned flour and throw into a pan of hot peanut oil. Delish! Just don’t toss the pan dripings! Add a little butter and flour to that, throw in some cream and seasoning and you’ve got the best gravy on the planet. Inspired! Going to fire up the grill tonight. Delayed comment response. Sorry about that! Did you try them? Were they good? Instead of using a tupperware container, I like to use a gallon zip lock bag. It means less dishes that I have to do later. This sound amazing. It’s going into my must try pile of recipes that seems to be growing by the day. Zip lock bags are perfect for this! You seriously MUST try this recipe. It’s SO GOOD. Now I’m craving it. This is great! I am sure Yes!Chef! would like this…especially the sauce. I will pin it on my Recipes to Try board. Thanks for the heads up! Thanks, Karen! It turns out great every time – even though sometimes I think the salt could be toned down a bit, but I’m sure Yes!Chef! puts his own spin on every recipe he makes. 🙂 Thanks for checking it out!